School of Phycics, NUI, Galway. The first aerosol measurements at Mace Head were carried out fifty years ago in 1958. 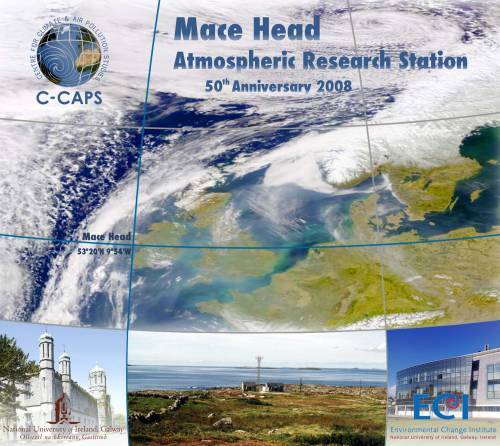 On 19th June 2008 NUI Galway held a symposium to celebrate the 50th anniversary of its Mace Head Atmospheric Research Station located on the west coast near Carna, Co. Galway. Beginning within the modest confines of a refurbished World War II coastal look-out post in 1958, Mace Head has grown to become one of the most important sites for atmospheric research in the northern hemisphere. Data from Mace Head is used to by climatologists around the world to predict global climate change and it is central to a number of international research networks and is a baseline station for the Global Atmosphere Watch of the World Meteorological Organization. At the symposium in June, which took place in the Cairnes Theatre at NUI Galway, principal leaders of the scientific projects at Mace Head outlined the achievements of the work there and the importance of these results for policy makers in the area of global climate change, air quality and other environmental conditions in Ireland. The Symposium, which was free and open to all, was followed by an Open Day at Mace Head on Friday 20 June.